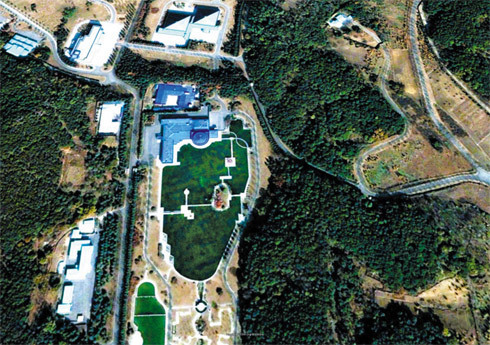 An American collector of satellite images of North Korea on Wednesday claimed to have spotted leader Kim Jong-il's luxury villa in pictures of northern Pyongyang. Curtis Melvin, speaking on CNN, claimed what appears to be a compound in photos from Google Earth is one of several houses used by Kim. On the BBC on Monday, Melvin claimed he had confirmed the house was Kim's through a source in North Korea. Google Earth shows the compound with a swimming pool and a water slide in the Ryongsong District in the suburbs of Pyongyang, which is where according to other information Kim's residence no. 21 is located. It is said to be where Kim spends most of his time when he is in Pyongyang. But North Korea expert Hazel Smith said it is difficult to know where Kim Jong-il lives, saying the facilities in the satellite image "look similar to some of the diplomatic compounds I've seen."